It really ought to be possible to run the minimal build on a P1 with an external flash chip. Ya know... a HIGHLY useful thing would be a mqtt CLIENT for the p1. Obviously some kinda wifi interface chip will need to interface between the p1 and the 'net. P2 mqtt server, with P1 mqtt slaves running all about? What's wrong with an SD Card for storage? I don't think any fancy USB mass storage mode or anything like that is required. Better to get the basics up and running first. It looks like the Mu installer includes a bunch of regular Python distribution files in its download. I think this could be pared down for used only with MicroPython, if a smaller download is required. Still, it's a 95MB download and 350MB installed, which isn't exactly huge. Seems pretty lightweight to me comapred to almost any other modern Windows program. As far a CircuitPython vs MicroPython - I wonder what Adafruit's thoughts are on accepting new boards into their upstream? I only see 1 non-Adafruit board listed as being supported, and it's referred to as a ""Third-party" or "non-Adafruit" boards". Personally I'd rather see P2 be an equal among MicroPython boards, vs being a "Third-party or non-Adafruit board" among CircuitPython boards. I was chatting with a friend today and asked why his team had chosen to embed Lua as a scripting language in their software rather than Python, etc. He said he personally preferred something with a more C like syntax but Lua was far faster. I am rather lukewarm on Python despite its popularity. It is relitivly slow in execution and the 'the List is all data structures' sort of paradigm seemed an odd choice to me. "Everything is a list" sounds like LISP. However, I think Lua also has LISP-like features but with a more familiar syntax. You're right though, it would be good to make an attempt at porting Lua as well. Do you know if it is written in C or C++? We have a way to compile C for the P2 but not C++ currently. Lua was far faster than what ? Did he give specific numbers and platforms ? The language itself does not determine speed, it is what happens downstream. Compiled languages will always be faster than byte-code ones. Speed. LUA blows Python away in the speed category. I really wanted a C syntax style scripting language like AngelScript. But none of them were even close to the speed of LUA. This is for a motion control sw package on Windows. In the MicroPython docs, they talk about having 3 levels of code 'emitters'. A 'Viper' emitter that puts out more optimized native ARM code, at the cost of some potential incompatibilities. So it seems possible to start with the bytecode and move toward faster solutions later on, by implementing a native P2 emitter. Inline assembly is also supported for ARM, and wraps nicely into Python functions, so a similar implentation could be used for P2. 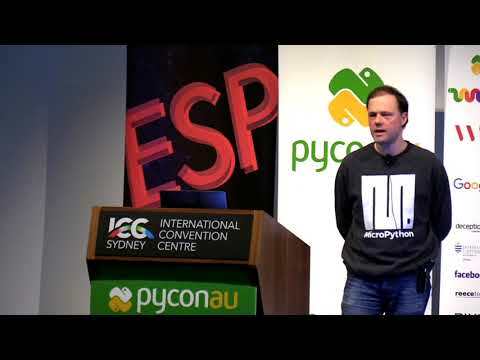 I just watched a video last night from the author of micropython. He was talking about optimizations choices he made to get the thing to run on microcontrollers, and I'm pretty excited about what micropython can do. I think it's going to going to be quite a good fit for propeller 2. I'll link it here the minute I can find it in my viewing history. Might be worth reaching out to him and see what his thoughts are about how best to get it to run on an 8 core uC. He knows the codebase and the design decisions the best - he would be able to provide good insight as to the best way to make it fit. That is a great suggestion. My python skills are modest, but probably enough for this discussion. It sure looks to me like he made a great set of trade-offs. You get most of python. And it's reasonably fast. Just getting him to think about it a little is probably worth it. Yeah red, I'm curious to see where you go with all that. The functional discussion was a big help. I sort of get it. I can see using the Elixir environment now and a little bit of how to do it. That's big progress, if you knew me in these things. I did some playing around, the pattern matching is really insane. That and lists. It makes you think a different way. Now I'm not claiming to be able to get anything reasonable done yet, but I can see possibly doing it now. I think the big brain block that we got unclogged with our nice conversation was that state is something to be managed, and there certain ways to do that to limit complexity and other issues. When I approach these topics before, it was as if State didn't exist at all, and that's doesn't work. But, containing it in those agents, or whatever they're called I can't remember off hand right now, will be really interesting to see on this chip. We'll see where I get to. No promises. He did pack inline-assembly in there. Using a python ish kind of syntax. That has real potential on P2. PASM is going to be needed on this chip. At least for a while. Maybe a long while. I've got an unrelated problem, that I'm thinking I may use Python to solve. This would be kind of a nice side discussion see where it goes. Lachlan is in contact already with Damien George (above, in the video). He's aware of the P2 and has expressed some interest, but that's about all I know. I will be writing him a message this weekend. Let me know if there is anything I can do to help. This sounds like an interesting project. Absolutely. We're getting asked a lot of questions about tools and many people want to participate. We're still learning about the possibilities, potential contributors, etc. before we make decisions. It is our intent to have some open discussions really soon, but we need to have some boards in people's hands first. In fact, some of us can start before the boards are delivered since we have Prop123-A9 boards or some other FPGA that can run the P2 images. Well I won't complicate things then. Let me know if I can help. I'm confused. Does MicroPython use LLVM or are you just talking about a P2 emitter to get C/C++ working? Maybe because I think the micropython kernel is currently written in C.
Was he using a single or multi core processor in that video? I would think all that time consuming or repetitive tasks would be best handled by the cogs. One cog for Search, one for Read, maybe one cog that compiles or precompiles (whatever is done for the VM to run). Oh, and one cog for the VM or maybe a few breaking down the tasks. That's sort of what I meant when I mentioned getting C/C++ working. That would be a first step for porting MicroPython. However, it is also possible that MicroPython makes more direct use of LLVM although that seems somewhat unlikely. By VM I assume you mean the memory manager. That's tricky when you have multiple asynchronous processors accessing the same heap. I wonder if MicroPython is designed with that in mind? Does it support multiple threads? Does it support multiple threads? I saw a demo of Micropython running 4 threads at our local MP community meeting just this week. - is LLVM the best tool to achieve the Python port? Is it the same tool Damien used when he created MicroPython? - does it matter if we use the same compiler as Damien, if his is different? Would we have better results if we used the same compiler? You just need a C compiler to port Python to the P2. LLVM may be a good way to make a C compiler for the P2 but GCC would also work. Which is best might depend on who you have to do the job. Both are likely a lot of work. You need to find people familiar with LLVM or GCC to do this. It sounds like Damian is familiar with LLVM but is he actually available to help create an LLVM-based P2 C compiler? Not necessarily. You need a good C compiler that targets the P2. Sorry, I don't know anything about the Mu editor.